Congressman Rehberg continues to have problems with land designations such as national monuments that our nation uses to protect wild places and the public interest in those places. This piece of legislation is timed just right since it will be the 100th anniversary of the political campaign of 1912. 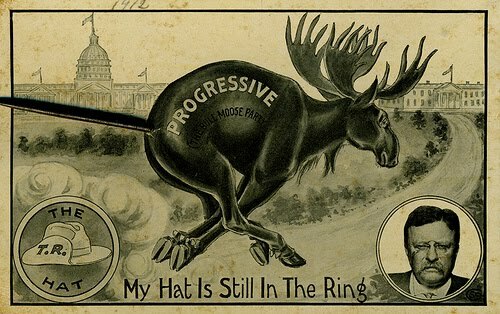 That campaign featured the emergence of the Bull Moose Party and it had to do with conservation, land designations, and the public interest in such actions. A brief historical review of setting land aside for conservation purposes shows us that no one person did more than a Republican president named Theodore Roosevelt. He was our 26th president and held that office from September of 1901 through early 1909. During that time he set aside 230 million acres for conservation and protection of our national treasures and natural assets. Little things, like the Grand Canyon. When he was done, it was just about 10% of America. No one fought harder to stop these protections than conservative western congressmen, including Montana’s U.S. Senator William A. Clark (1901-1907). To refresh our Montana memory, it was a time when U.S. Senators were elected by a vote of the state legislature. Historical author Timothy Egan wrote that for copper-baron Clark it was, “… a position he had initially purchased with bundles of crisp $100 bills handed out to legislators in monogrammed envelopes – W.A.C. stamped on the fold, $10,000 per vote.” Clark’s defense at the time was, “I never bought a man who was not for sale” (Egan 2009). The prize then, as it is now, was privatization and commercialization of natural resources. Clark, those like him, and the corporate robber-barons of that era, championed privatizing all of America. At one point Clark and his cronies successfully attached a legislative rider to forbid TR from creating any new national forest reserves in Montana and five other western states. In the seven days he had to either sign or veto the bill, TR responded by adding 16 million acres of national forest reserves in those states. For Montana, those seven days meant the Big Hole, the Big Belts, the Little Rockies, the Cabinets, the Custer, and additions to the Lewis and Clark national forests. Today I do not have to get J.P. Morgan’s permission to hunt and fish those places. The battle between exploitation and conservation has persisted through the century that followed. It is only slightly more subtle today with the enemies of conservation attacking budgets, vilifying those carrying the conservation message, and purging dissenting political thought from their own political ranks. When Theodore Roosevelt left the presidency in 1909 the exploitive counter attack was immediate. When TR saw the abandonment of his many reforms he returned to the political arena in 1912 by entering every Republican Party primary election held at that time. The party held twelve primary elections that year -- TR won nine, Bob Lafollette won two, and the incumbent President Taft won but one. However, the party bosses succeeded in denying TR the nomination at their convention in 1912. He thus bolted the Republican Party and ran as the Bull Moose Party candidate finishing second to the Democratic candidate Woodrow Wilson. Taft and the divided Republican Party finished a distant third. When the American people took a closer look at Theodore Roosevelt, they chiseled his image into the granite of Mount Rushmore alongside Washington, Jefferson and Lincoln. I suspect part of the reason we the people did that is because we appreciated what he did for us, the land values we hold, and the conserved landscapes that make Montana the last best place to be a hunter and angler. As for Senator William A. Clark, we are still hauling the polluted legacy he dumped into the Clark Fork River off to a toxic waste disposal site. Mark Twain described Clark for posterity when he wrote about Clark: “He is as rotten a human being as can be found anywhere under the flag.”(Egan 2009). It is a shame that his philosophy seems reborn in the 21st century. Egan, Timothy, The Big Burn, Houghton Mifflin Harcourt, Boston – New York, 2009.